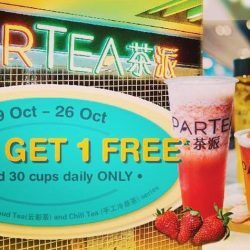 Partea, the latest tea outlet to hit town, is offering a FREE cup of tea when you buy a Chill Tea or Fluffy Cloud Tea from now till 26 October 2017! Its drinks are made of high quality Chinese tea leaves from Taiwan and infused with fresh fruit. It can even be safely consumed by diabetics! Head to Partea at Suntec City and enjoy the limited offer now!